A 73-years-old Russian woman Tamara Talashmanova from a small town of Sysert in Ural has been under home arrest in Uzbekistan since April 26, 2012. The Russian pensioner with no previous criminal record faces 5 to 7 years in prison. After visiting her old friends in Uzbekistan, Tamara Talashmanova was on her way home catching a flight from Samarkand to Ekaterinburg on the 26th of April. At the airport she was stopped after police found a blister of Phenazepam pills in her hand luggage. Uzbek authorities took her foreign passport and a plane ticket and put her under home arrest pending trial on charges of “drug smuggling”. Currently, the pensioner stays at her friends in Bukhara, some three hundred kilometers away from Samarkand where she has to go regularly for interrogations. Such interrogations may take up to several days. According to her grand-daughter Nadezhda Gileva, the police provides Tamara with accommodation in barracks that they refer to as a “hotel”. Local authorities refuse to provide her with any other assistance, including medical surveillance or financial support. Meanwhile, the old woman is running out of medications that she can not acquire locally, in pharmacies in Uzbekistan. 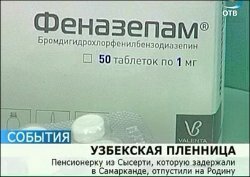 Tamara Talashmanova has claimed getting Phenazepam on a valid prescription. Her grand-daughter Nadezhda Gileva has found out that Uzbek police made no official inquiries regarding validity of the prescription to a relevant agency in Russia. No inquiries have been sent to the Russian embassy in Uzbekistan or the Russian foreign ministry either. Nadezhda reported her grandmother’s situation to the governor of Sverdlow province Alexander Misharin, president’s representative Eugeniy Kuyvashev, and the official representative of the foreign ministry Sergey Khvan, as well as members of the Rusian parliament. Alexander Chesnokov, from the Rusian foreign ministry told “Vedomosti” that they are going to take up the matter very seriously, considering the pensioner’s age. This case has reminded of another Russian citizen who was arrested in Uzbekistan and then sentenced to 16 years in prison by the Uzbek court upon charges of “illegal entry into Uzbekistan”, and “treason”. He was released from prison only after the Russian president Dmitriy Medvedev mentioned his case during a meeting with the president Islam Karimov of Uzbekistan. Meanwhile, a tourist from Kazakhstan Ermek Kosmogambetov is kept in jail in Uzbekistan after he was arrested at the border to Kazakhstan and Uzbekistan on 16th of March, 2012. He is being accused of carrying materials containing religious extremism and separatism, just because the police found videos of religious nature in his notebook. Though his family members claim that accusations are totally groundless, he may face up to 10 years in prison.